Some alumnae of Mount Holyoke College are buzzing about a forthcoming biography of Mary Emma Woolley, the college's president from 1900 to 1937. 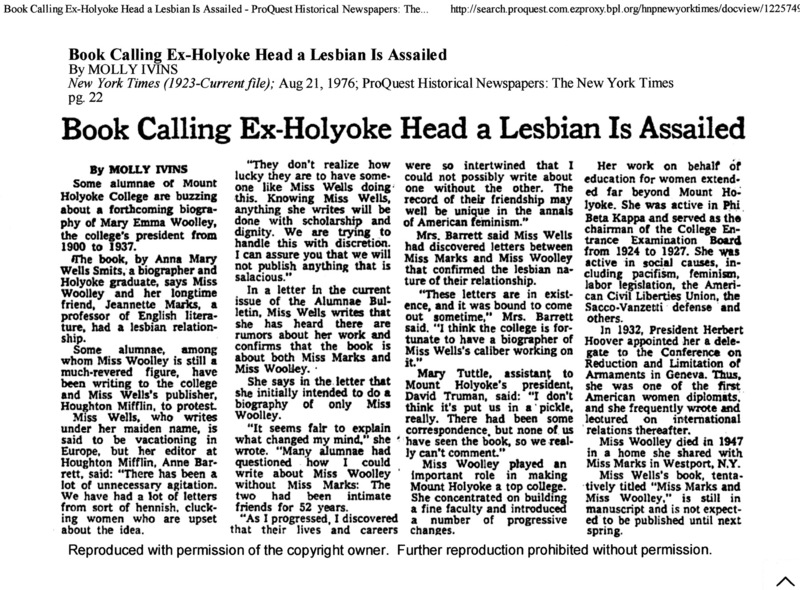 The book, by Anna Mary Wells Smits, a biographer and Holyoke graduate, says Miss Woolley and her longtime friend, Jeannette Marks, a professor of English literature, had a lesbian relationship. Some alumnae, among whom Miss Woolley is still a much-revered figure, have been writing to the college and Miss Wells's publisher, Houghton Mifflin, to protest. Miss Wells, who writes under her maiden name, is said to be vacationing in Europe, but her editor at Houghton Mifflin, Anne Barrett, said: "There has been a lot of unnecessary agitation. We have had a lot of letters from sort of hennish, clucking women who are upset about the idea. "They don't realize how lucky they are to have someone like Miss Wells doing this. Knowing Miss Wells, anything she writes will be done with scholarship and dignity. We are trying to handle this with discretion. I can assure you that we will not publish anything that is salacious." In a letter in the current issue of the Alumnae Bulletin, Miss Wells writes that she has heard there are rumors about her work and confirms that the book is about both Miss Marks and Miss Woolley. She says in the letter that she initially intended to do a biography of only Miss Woolley. "It seems fair to explain what changed my mind," she wrote. "Many alumnae had questioned how I could write about Miss Woolley without Miss Marks: The two had been intimate friends for 52 years. "As I progressed, I discovered that their lives and careers were so intertwined that I could not possibly write about one without the other. The record of their friendship may well be unique in the annals of American feminism." Mrs. Barrett said Miss Wells had discovered letters between Miss Marks and Miss Woolley that confirmed the lesbian nature of their relationship. "These letters are in existence, and it was bound to come out sometime," Mrs. Barrett said. "I think the college is fortunate to have a biographer of Miss Wells's caliber working on it." Mary Tuttle, assistant to Mount Holyoke's president, David Truman, said: "I don't think it's put us in a pickle, really. There had been some correspondence, but none of us have seen the book, so we really can't comment." Miss Woolley played an important role in making Mount Holyoke a top college. She concentrated on building a fine faculty and introduced a number of progressive changes. Her work on behalf of education for women extended far beyond Mount Holyoke. She was active in Phi Beta Kappa and served as the chairman of the College Entrance Examination Board from 1924 to 1927. She was active in social causes, including pacifism, feminism, labor legislation, the American Civil Liberties Union, the Sacco-Venzetti defense and others. In 1932, President Herbert Hoover appointed her a delegate to the Conference on Reduction and Limitation of Armaments in Geneva. Thus, she was one of the first American women diplomats, and she frequently wrote and lectured on international relations thereafter. Miss Woolley died in 1947 in a home she shared with Miss Marks in Westport, N.Y.
Miss Wells's book, tentatively titled "Miss Marks and Miss Woolley," is still in manuscript and is not expected to be published until next spring.